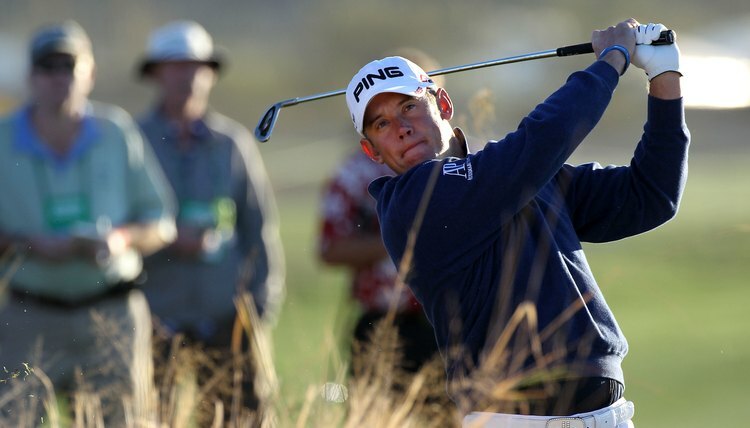 Lee Westwood was the first golfer to attain world No. 1 status using investment cast irons. Some golf topics are almost as volatile as politics and religion. One such debate concerns how irons are made. There was a time when the pros would use only forged irons, and cast irons were limited to amateurs. That has changed, with cast irons finding popularity even among the pros. The main difference from a practical standpoint is the ability to bend a forged club to adjust the lie angle and loft with minimal risk of the club breaking -- unlike the cast club, which can only handle a few adjustments. Forged clubs were once made by blacksmiths. Today, they are made essentially the same way. The process begins with heating a steel bar until it's malleable, then pounding it into shape. Blacksmiths used hammers and anvils to do this; modern forgers use machines. The heated bar is hammered as many times as necessary to achieve the desired result. The virtue of a forged iron is its consistency. Because a craftsman has a lot of control over the results of his work, forged clubheads can be formed with great predictability. In one respect, the way cast irons are made is similar to the way ice cubes are made. Molten metal is poured into forms and allowed to cool. Then the forms are broken to expose the new "blank" clubheads. Additional machining transforms these "blanks" into finished clubs. The virtues of cast irons are their flexibility and price. Manufacturers can easily create clubheads of any shape, and they can do it more inexpensively than making forged clubs. Originally, it was the casting process that made "game improvement" clubs possible. It was simpler and quicker to make a cavity-back club by pouring molten metal into a form than by pounding one out of a block of steel. Forging took many man-hours to complete even the simplest shape, which was usually a thin profile called a blade. The most "game improvement" you could hope for with casting was a muscleback design, a blade with a thicker sole that extended halfway up the blade. Castings also could end up with air bubbles in the metal, affecting both the feel and accuracy of the club. That's why pros chose forged clubs, which were less forgiving, but more consistent and expensive, while amateurs chose cast clubs, which were more forgiving and less expensive. Forged clubs are still usually more expensive to make than castings. But advancements in both casting and forging have made most of the other concerns moot. Increased quality control and the use of computers in the design and manufacturing stages has made it possible to create both forged game-improvement clubs and cast clubs without air bubbles or other quality problems. Frank Thomas, who was the technical director for the United States Golf Association for 26 years, says that two clubs of the same design – one forged and one cast – will be virtually identical in feel and performance. The result? You can choose to play either type of club and still get the best performance possible.